Delmer Daves is one of the most underrated directors of westerns and is one that deserves to be ranked alongside the likes of John Ford and Howard Hawks. He had a natural affinity for the West and the Native Americans that inhabited it. Daves had already made a few westerns by the time of Jubal (1956), but he did not see it as a true western, rather something else – a tale of redemption. We meet Jubal Troop (Ford) stumbling, dazed and confused, through the countryside. He’s found by a passing ranch owner named Shep Horgan (Borgnine) who takes him back home where the stranger is nursed back to health. The ranch hands are all inviting save “Pinky” Pinkum (Steiger) who takes an instant dislike to Jubal. Shep offers Jubal a job, which he reluctantly accepts, due in large part to the rancher’s gregarious nature. Jubal soon proves his worth, but faces temptation in the form of Shep’s bored wife, Mae (French), who makes her intentions pretty clear. Glenn Ford was an actor who always seemed to convey an honest, upstanding nature, but Jubal is something of an enigma. We don’t know much about his past and he’s in no hurry to talk about it either. At first, he doesn’t seem interested in staying at the ranch for very long, but what changes his mind? Is it Shep’s offer to become foreman of the ranch? It puts Jubal in an awkward position with the rest of the ranch hands, especially Pinky, because he’s only been there for a little while. Ford plays Jubal as a nice guy, but he’s no pushover, standing up to Pinky when challenged. As he’s done many times in his career, Rod Steiger plays a fiery antagonist. Pinky has his own history with Mae and resents Jubal’s arrival, especially for what he sees as preferential treatment from Shep. Pink is all bluster and Steiger excels at showing off his character’s prickly arrogance. 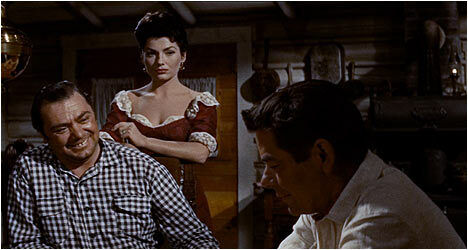 Ernest Borgnine rounds out the trio as the good-natured ranch owner. Shep is a loud, jovial sort with a big laugh – the perfect role for the veteran actor. There is a bit of a tragic side to Shep as he has no idea of his wife’s cheating ways. Daves makes excellent use of the widescreen aspect ratio, capturing the open landscape and the characters’ place in it. He presents all of the western iconography and then lets it recede into the background in favor of the human drama that unfolds. Jubal is much more than a western; it is a complex drama full of betrayal and jealousy enacted by a first rate cast.